In 100 days from today the cycling road race of the London Olympics could see Mark Cavendish win gold for Britain. 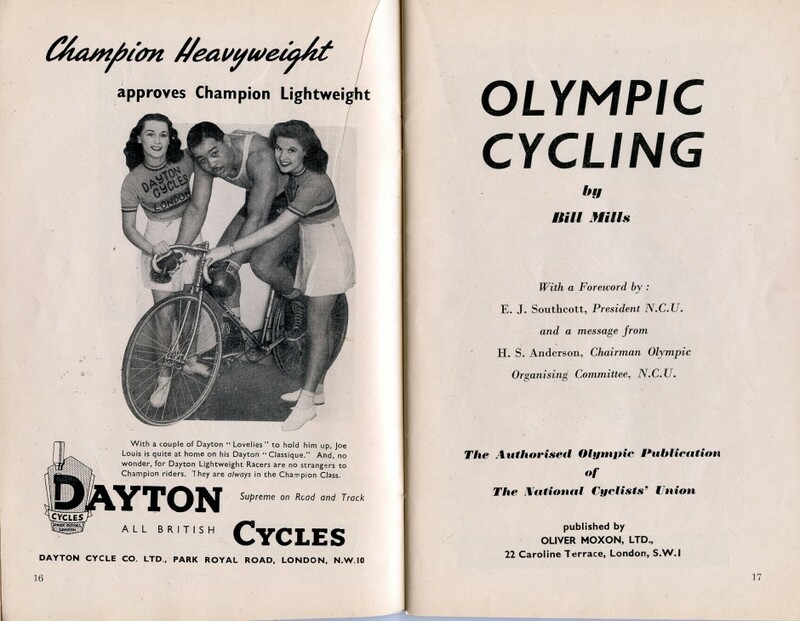 At the London Olympics of 1948 the Mark Cavendish of his day bagged silver medals on the track, but sprint star Reg Harris wasn’t one of the 101 riders who took part in the 120 mile road race. The modern peloton will ride on the (closed) public roads of Surrey, including a short stretch of the “most famous cycling highway in the world.” In 1948 the road race did 17 laps of a course using the minor roads of the Royal Park at Windsor, only using public roads for two short stretches. On this blog-of-the-forthcoming-book I don’t usually cover racing, or cycling after the 1930s – my interest lies in the 1860s through to the 1920s – but I do cover the history of asphalt. This is actually more pertinent than you might think as middle class pushy cyclists had a major part to play in the lobbying, and later trials, that led to asphalt capping the roads of both Britain and America. 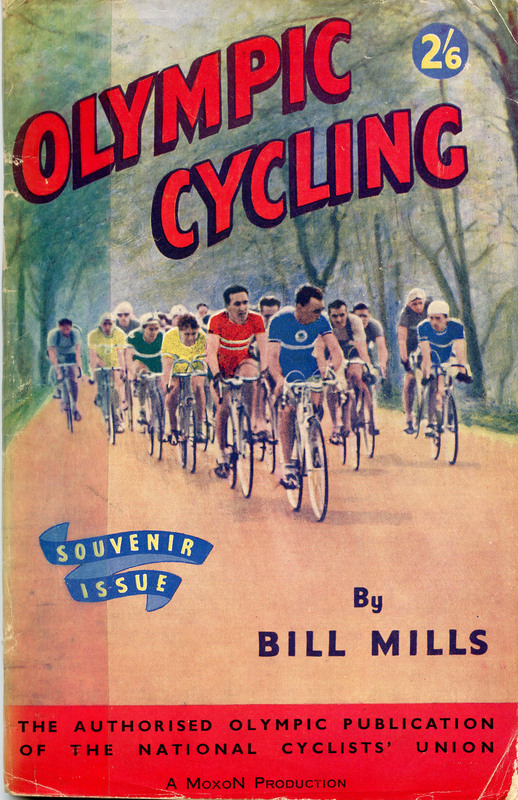 As an asphalt buff I was intrigued to see, in the National Cyclists’ Union guide to the 1948 Olympic cycling events, an advert for Resmat cold rolled asphalt. This was a non-skid asphalt that was smooth enough to be used for the Herne Hill velodrome track. In the 1930s and 1940s, asphalt used on roads tended not to be highly skid-resistant because car speeds were relatively low. It was the advent of the motorways in the late 1950s and 1960s which accelerated the need for more skid-resistance. Roads could be made more skid-resistant by using coarser aggregate, increasing the road’s rugosity, or roughness. Calcined bauxite, imported from Guyana, is a sharp roadstone applied to a road surface with epoxy resin (yes, the same stuff that binds carbon fibres in composite bike frames). Bauxite and epoxy resin was used from the 1950s but was prohibitively expensive and applied sparingly. A curve on the Hammersmith Flyover – built at the end of the 1950s – was dressed with bauxite because drivers routinely took the bend too quickly. Incidentally, London’s famous elevated roadway was built by Marples, Ridgway and Partners. This Westminster-based civil engineering contractor was founded, and majority-owned, by the colourful Ernest Marples, who was transport minister from 1959 to 1964. In 1975, Marples, who had by then been made a baron, fled the country in rather a hurry, not because of his hushed-up proclivity for prostitutes, his introduction of double yellow lines and traffic wardens, or the conflict of interest in building motorways at the same time as cutting Britain’s rail network (the infamous Beeching cuts were his work) but because of tax evasion. He may have killed off the railways and promoted, instead, the use of motorways but Marples was a member of the CTC, the first member to rise to the role of minister for transport. He and his wife toured by bicycle while at their holiday home in France. Where was I? 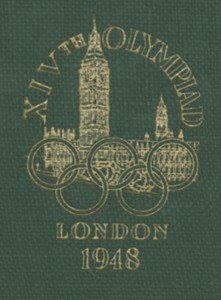 Oh, yes, the London Olympics of 1948. The Resmat surface on the Herne Hill track couldn’t have been made with bauxite as that would have been too rough for track use. However, no amount of searching has turned up details of how the Resmat asphalt was made anti-skid. All I could find out was that the Teeside company went belly up in the same year England won the football World Cup. 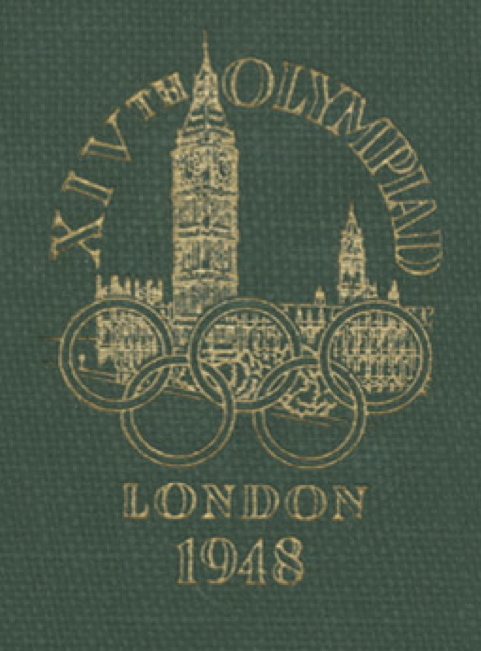 While the 1940s aren’t my period I can’t help but devote some space to the 1948 Olympiad. 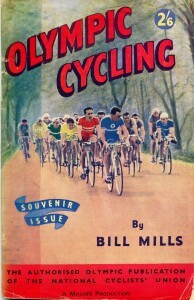 The Authorised Olympic Publication of the National Cyclists’ Union (the NCU was the forerunner to the British Cycling Federation and was founded in 1878, some months before the creation of the Bicycle Touring Club, which became the Cyclists’ Touring Club) offers a fascinating glimpse of cycle sport at a time when it was relatively mainstream (Reg Harris was the Sports Journalists’ Association’s Sportsman of the Year in 1950). 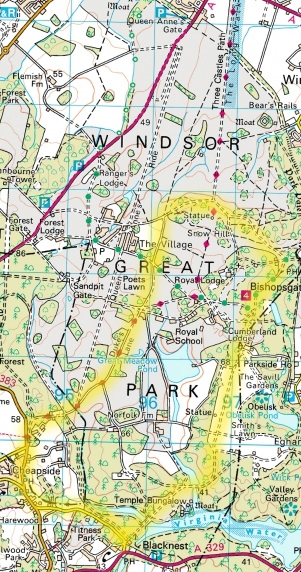 Below are two further extracts from this publication, plus a map of the route. Of all the Olympic programme, it was the cycling events which produced the greatest number of surprise results, not a single one of the eventual champions having been expected to win his event. 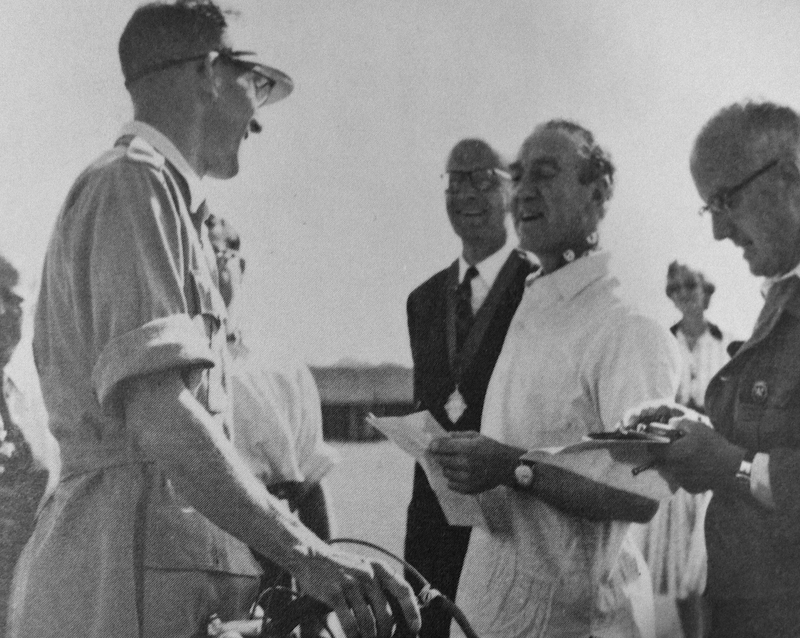 As always, most attention focused upon the sprint, one event which it had been confidently expected would be won be a rider on his home track and cheered on by his own supporters—Reg Harris, already world champion among the amateur sprinters. Yet it was M. Ghella, of Italy, who was the winner in two straight heats, both won by comfortable margins. 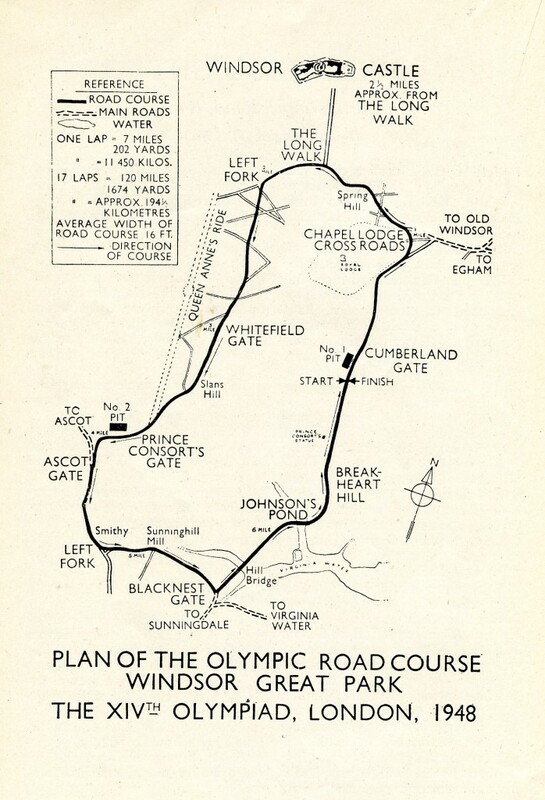 The final Olympic cycling event was the road race which was held in Windsor Great Park by gracious permission of H.M. King George VI. The race was over a course of about 120 miles in 17 laps. The course included no severe gradients, but was sufficiently undulating to provide a real test of stamina, and with bends, especially that at Blacknest Gate, which needed all the skill of the contestants at the speed at which the race was run. Preparations had been made for a crowd which, it had been thought, might reach forty or fifty thousand, but this was, unfortunately, one of the wettest days of the whole Games, and it was surprising that there were as many as the 15,000 enthusiasts who, it was estimated, were on the circuit when the race was started by H.R.H. The Duke of Edinburgh. 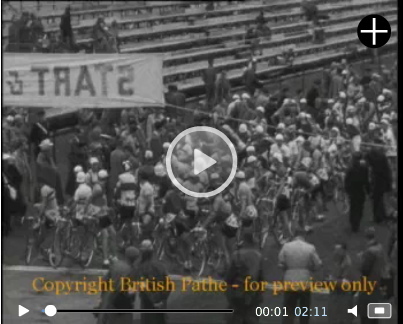 Although attempts had been made to improve the surface of the roads within the Park, the wet weather had nullified them and unfortunately, punctures were frequent, several fancied riders being eliminated from the race. G. Thomas (Great Britain), tried a breakaway on the penultimate lap, between Ascot and Blacknest Gates, and he was chased by L. Delathouwer (Belgium). The pair held a 15 second lead as they climbed Breakheart Hill and finished the lap. But with five miles still to go, the group were gaining fast, and as they caught the leaders, all the riders easied in readiness for the sprint which seemed certain to decide the race. J. Beyaert made his first real effort at Ascot gate, but, led by J. Hoobin, the group regained contact. The decisive moment was not, however, to be in the final sprint after all. A short distance before the top of Breakheart Hill, and with over half a mile still to go, Beyaert again sprinted into the lead and opened up a gap of at least eight lengths which was too much for any of his rivals, all of whom seemed more tired than the winner at the finish. Voorting won the sprint finish from the remainder of the leaders for second place, after being in the leading bunch ever since the third lap, and Belgian riders, L. Wouters and L. Delathouwer, finished third and fourth to gain the team title with the aid of E. Van Roosbroeck in twelfth place. 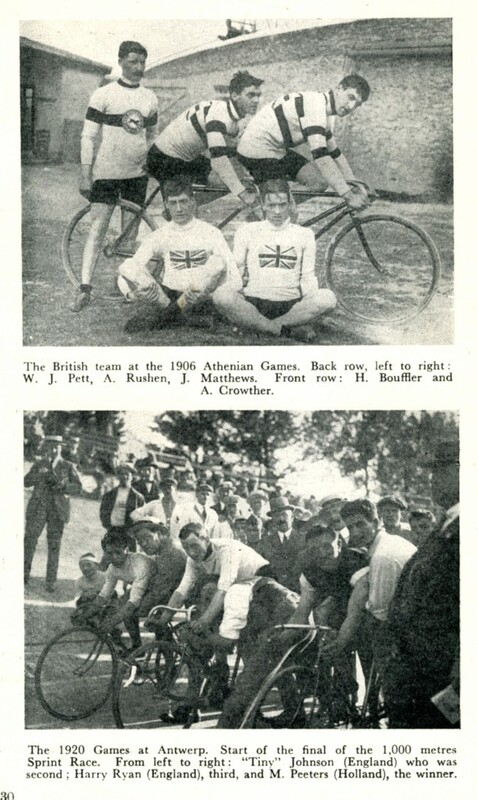 Great Britain also had two riders among the leading group, R. Maitland and G. Thomas, and C. S. I. Scott came in sixteenth to gain the second team award. A certain number of station wagons had been equipped with special racks to carry two or three machines and their riders, but this was quite inadequate to meet the demand of nearly all the competitors that the cycles should be conveyed to and from the training grounds on every occasion. Operators refused to take the machines aboard with their owners for fear of damage to the seats of the coaches, so lorries and furniture vans were brought into service. This brought complaints from some teams that they were prevented from accompanying their bicycles by this method of transport. There were actually no hold-ups, but the whole operation was the cause of a great deal of daily last-minute arrangements. The best answer to the problem was obtained by having seats stripped from one side of a 32-seater coach. This enabled about twelve machines to be carried in the space so provided, the riders, trainers and others interested in the teams, being able to travel in comfort with the bicycles. The cost of such an arrangement was twice that of the lorries, but there is no doubt that it gave complete satisfaction to those able to make use of it. Thanks to US-based cycle historian Dr Andrew Ritchie for supplying the inspiration and some of the images for this piece. "How cyclists were the first to push for good roads & became the pioneers of motoring." ROADS WERE NOT BUILT FOR CARS is a print, Kindle, iPad and free e-book about roads history. The coming of the railways in the 1830s killed off the stage-coach trade; almost all rural roads reverted to low-level local use. Cyclists were the first group in a generation to use roads and were the first to push for high-quality sealed surfaces and were the first to lobby for national funding and leadership for roads. They were also the first promoters of motoring; the first motoring journalists had first been cycling journalists; and there was a transfer of technology from cycling to motoring without which cars as we know them wouldn't exist! Nearly seventy car marques – including Rolls-Royce, Aston Martin, Chevrolet, Cadillac and GMC – had bicycling beginnings. 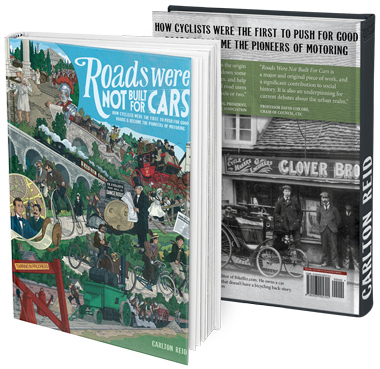 'Roads Were Not Built for Cars' is a history book, focussing on a time when cyclists had political clout, in Britain and especially in America. The book researches the Roads Improvement Association - a lobbying group created by the Cyclists' Touring Club in 1886 - and the Good Roads movement organised by the League of American Wheelmen in the same period. The book was published in a Kickstarter limited-edition in September 2014. Island Press of Washington, D.C. published a revised second-edition in April 2015. Thanks to research grants and advertising support, text-only PDF chapters from the book are slowly being made available for free to read online. The free distribution model is being used in order to get the book seen by as many eyes as possible. The paid-for publications are richly illustrated; the free versions have had the pix stripped out and replaced with adverts. To get notification of the paid-for and free publications subscribe to the (infrequent) email newsletter. See below or in the sidebars. MOTORISTS' FRONT OF JUDEA: Apart from the pneumatic tyre, ball bearings, differential gears, roads, motoring, car ads, and aviation, what have the cyclists ever done for us? Roads Were Not Built For Cars 2015 | All rights reserved. Words and pix on this site are mine, all mine. Privacy, and terms and conditions. | Carlton Reid. Tel: 44 191 2652062 Contact me by email.